Chord NOTE support your wonderful Music Life. Chord NOTE is a Song writer’s assistant tool. It assists in finding the right chords to match a melody or musical phrase. And it has great Chord Progression function and Scale library. For iPhone, iPod touch, iPad (Universal App). At a time like this, you can get guides to find some chords that match your melody by Chord NOTE. If you have composed some songs already, you know almost melody and chord have some same notes. Because the main part of melody is made up of constituent notes of chord in most cases. In the same way, you’ll be able to find Key to match your melody by Chord NOTE. 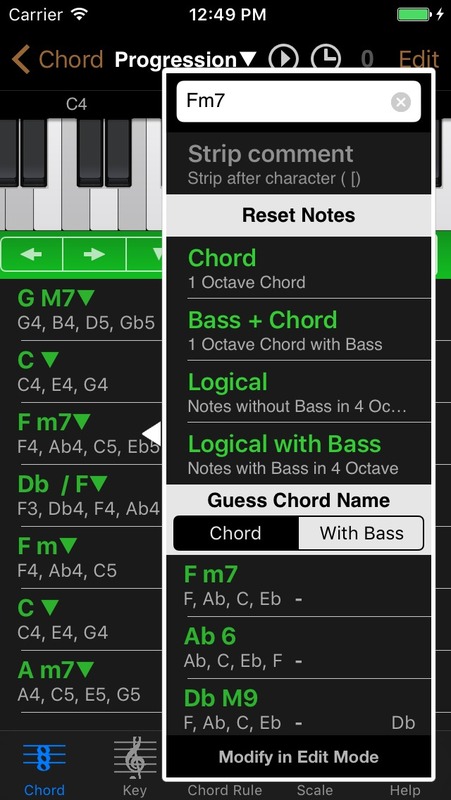 So Chord NOTE is very useful for finding the chord and key. If you record your singing melody, you can display the pitch of your voice. And you can sketch your songs by Chord Progression function. Chord Progression function will provide numerous features for you. Chord NOTE supports widening the imagination of your wings for real composer. Chord NOTE works fine without this option. However, when you’ll buy this low price add-on, you can use more Chords and Scales. It will provide a complete set usually. If you have some suggests, requests or questions, please send mail to this address <hidenoridev@therootage.com>. You write new melody that hit on. You pick up some essential notes (long notes, loud notes…). Tap (select) some notes at top keyboard in Key Tab. You have focused on a little Keys. Select a Key in the list. Set “Limit Key at Chord Search” Switch to ON. And also you can select Included All (contains Triad & Seventh and Substitute Chords). Now you can focus on limited chords by Key Tab & Chord Rule Tab. 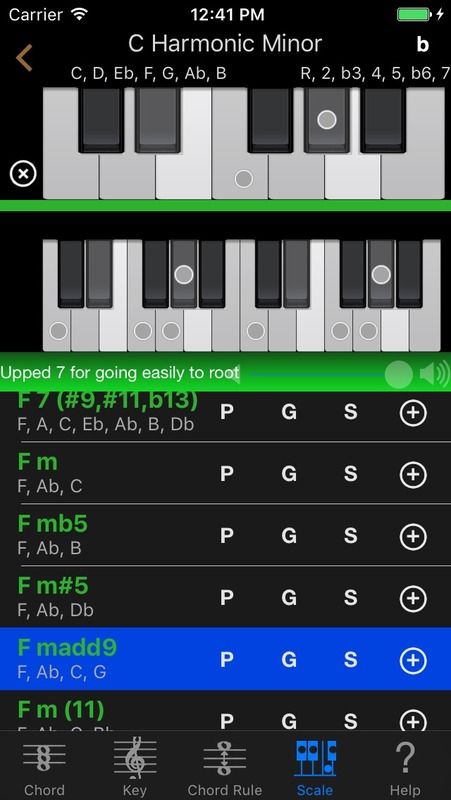 Tap (select) some essential notes of your melody at top keyboard in Chord Tab. If you can focus on enough less chords, tap the chord or really you play. Let’s consider which chord appropriate to your melody. Repeat process 6 & 7 for finding all chords for your melody. Main Tab. You can search for chords by some specific notes. And you can add chords to Chord Progression. You can select some specific notes by tapping the top keyboard. You can deselect note by tapping again same note. And you’ll be able to focus on chords by selecting multiple notes. If you’d like to deselect all notes by tapping the left side “X” button. And also if you tap arrow icon (Octave Button), you can change 1 octave / 2 octave display. The scrollable list shows chord names & constituent notes of chord. This list shows chords are filtered by Key Tab & Chord Rule Tab. And only shows chords contains selected notes on the top keyboard. You can listen to the chord sound by tapping. And displayed notes constituting of the chord as circle on the top keyboard. Key Field shows key selected in Key Tab (Only “Limit Key at Chord Search” switch turn ON). Rule Field shows chord rule selected in Chord Rule Tab (Only “Limit Key at Chord Search” switch turn ON in Key Tab). Tips : If Limit Key at Chord Search is OFF (or not selected any Key) in Key Tab, Rule Field shows “ALL”. ALL is all preset chords in Chord NOTE. It’s useful for just searching for chords contains some specific notes. You can change accidental to # / b. And you can set sound volume by slider. 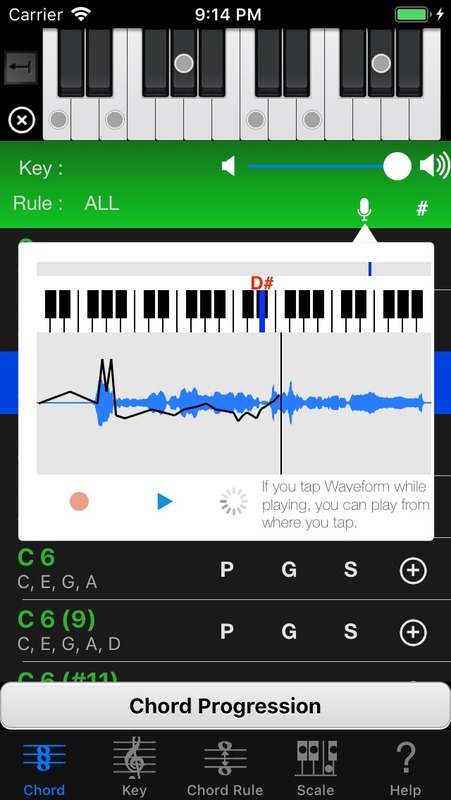 “P” button allows you to search piano specific chord forms of selected Chord by Piano Kit (another app). 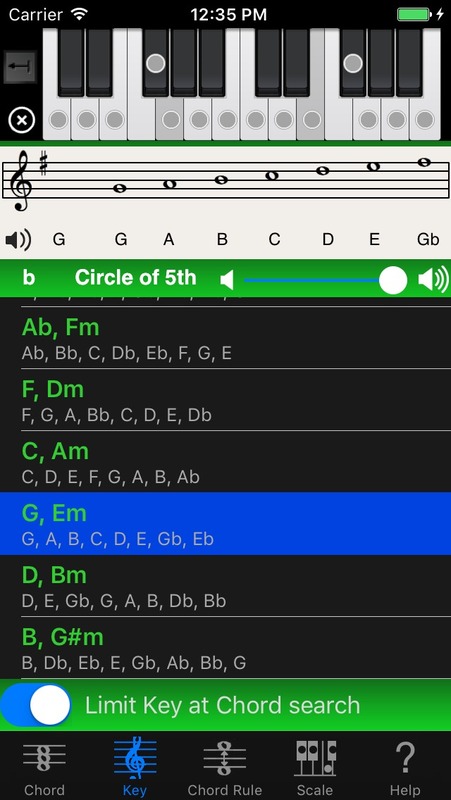 “G” button allows you to search guitar specific chord forms of selected Chord by Guitar Kit (another app). If you tap “S” button, you can search Scale. If there are locked icons in the list, you can use those chords by purchasing “Advanced Option” (In-App Purchase). When you press and hold on chord list, you can change display to Note Name / Interval on the fly. You can use this feature in same scene on other Tabs (without Edit mode of Chord Progression View). If you decide Key, it will be displayed these icons. Left is Major Key, Right is Minor Key. 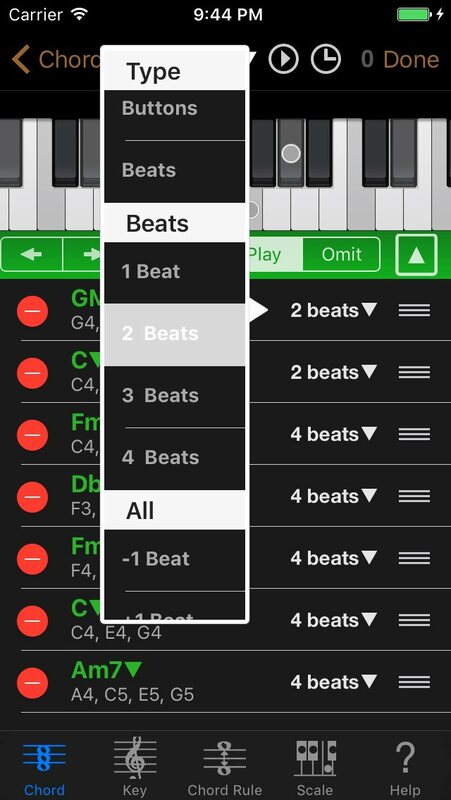 You can add chord to Chord Progression by tapping “+” button in the list. 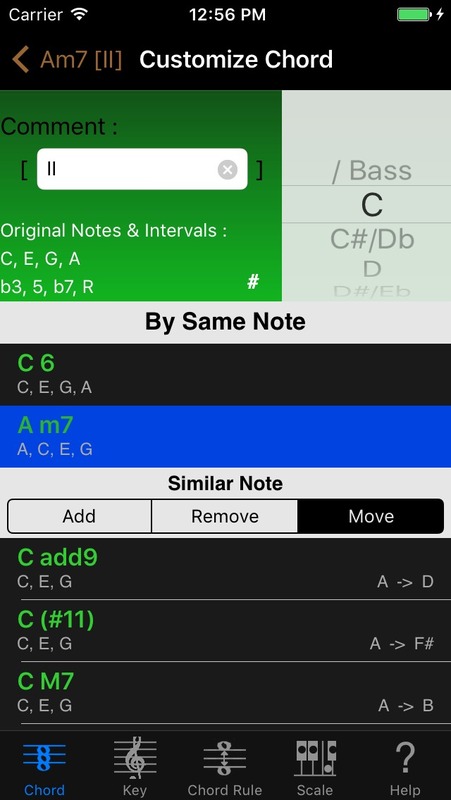 And you can show Chord Progression View by tapping bottom “Chord Progression” button. You’ll be able to learn detail of Chord Progression View at follow section. By the way, because of the ease of input name (chord / note), respectively sharp and flat, Chord NOTE use # (Shift-3) and b (Small B). From Ver 7.5, you can record singing melody and display its pitch by tapping Mic button. Please give permission to use the microphone when you tap Mic button for the first time. If you do not allow it, let’s permit the use of the microphone in Chord NOTE section or Privacy section of Settings app. In addition, you can open Settings app by tapping Mic button again. When you are ready, tap red circle Record button. The input sound from the microphone is recorded, and the current pitch is also displayed. Tap the Record button again to stop. Please tap blue triangle Play button. The recorded melody is played back. The currently playing pitch is displayed, and a graph showing the transition of the pitch is also displayed. You can stop by tapping Play button again. If you tap Waveform during playback, you can play from tapped location. It will be useful to listen and check the pitch again. The top blue little vertical bar indicates how well the pitches fit. The closer it is to the middle, the closer it is to the currently displayed pitch, the flat on the left and the sharp on the right. 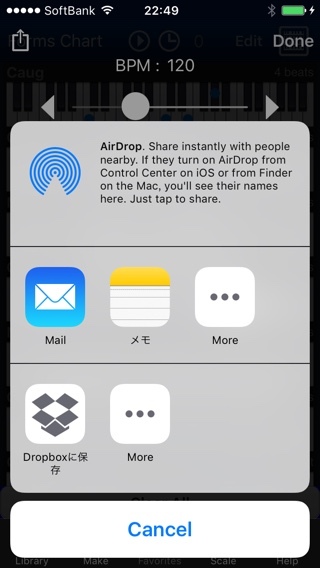 You can exit this recording mode at any time by tapping outside this popup window. You can search for keys by some specific notes. Please refer to Chord Tab section for basic part. Bottom list shows key names and constituent notes of key. If you select one key, upper part show the musical score. Most bottom – Limit Key at Chord search – switch is very important. If you turn ON, you can focus on limited chords in Chord Tab. Of course, you need to select one key in above key list. You can change display score style by tapping these rectangle. You can toggle play score sounds ON/OFF by tapping speaker icon in the score. If you tap “Circle of 5th” button, you can select a key by tapping easily. 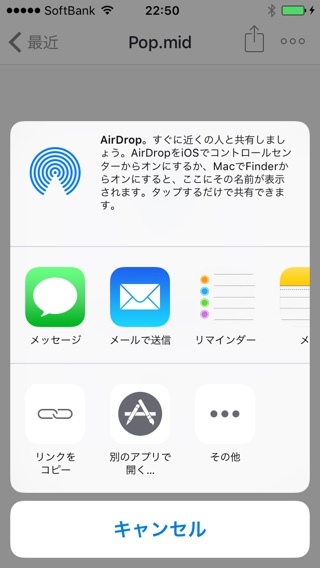 Circle of 5th is displayed from the beginning in the iPad. Decide kind of chords you use in Chord Tab. Substitute for Minor Key, Major Key are most useful chords in almost case. These library made by Shoichi Suzuki. Included All for Minor Key, Major Key contain Triad & Seventh and Substitute Chords. 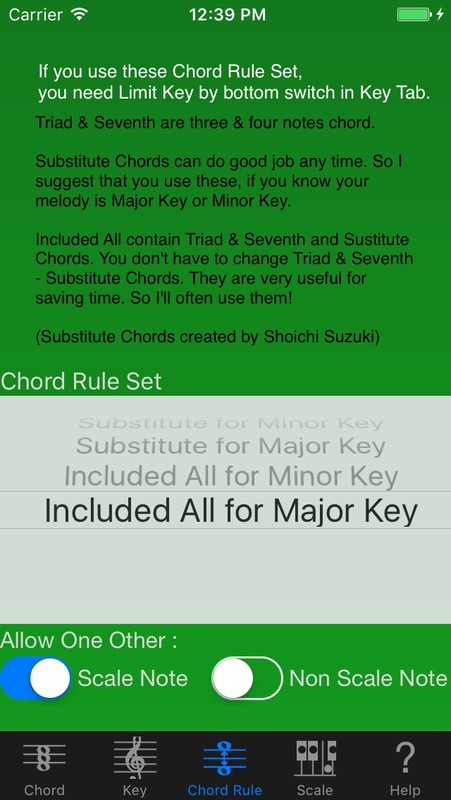 Chord List is long but you can save time for changing rule Triad & Seventh <-> Substitute many times. Allow One Other Non Scale Note : In addition to the listed chords, and to the list further chords comprises one another non scale note. If you don’t know your song is Major Key or Minor Key, we suggest selecting “Triad & Seventh”. And if you know this, we suggest selecting “Substitute for Minor Key” or” Substitute for Major Key”. Tips: Selecting “Included All for Minor Key, Major Key” is good idea for saving time to change rule Triad & Seventh <-> Substitute many times. And you need to turn ON – Limit Key at Chord search – switch in Key Tab, if you use these Chord Rule. You can search for many popular scales by tapping notes on the top keyboard. If you select notes on the top keyboard, Scale Tab lists only scales contain their notes. When you select a scale in the list, scale notes will be displayed with the circles on the keyboard. Blue circles are Root notes. You can change whether you’d like to play the scale sound by tapping the speaker icon beside the keyboard. If you select “Play” at “Scale / Play” button, you can listen any note sound by tapping keyboard without changing scale list. Chord NOTE has following Scales. Blues Major – Major pentatonic scale, but with an additional lowered fifth. 8-tone whole first – The diminished scale. Alternating whole step and half step intervals. Whole-step-first. 8-tone half first – The diminished scale. Alternating whole step and half step intervals. Half-step-first. If you purchase “Advanced Option” (In-App Purchase), you can use following Scales. 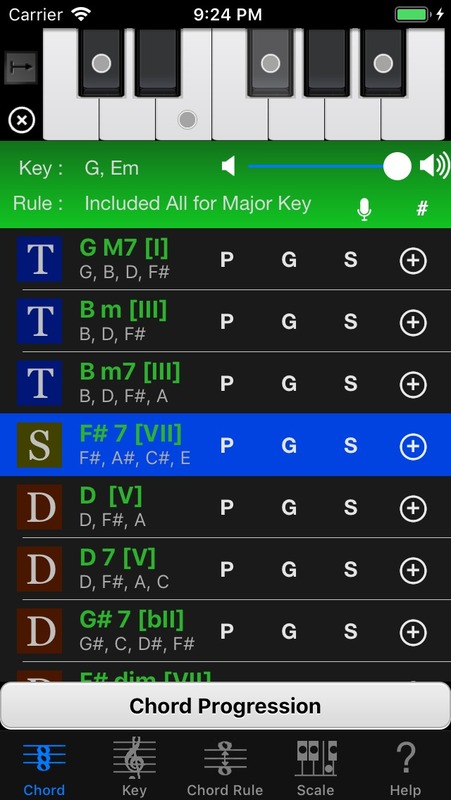 When you tap “ > ” button on the right side of each scale name, you can display chord list that including only scale notes. It shows chords list matched with its scale. Top 1 octave keyboard shows scale note as gray color. Please tap use notes on the top keyboard in your song’s part. They show circle dots and display bottom chords list matched your scale notes. You can operate this view as like Chord Tab. By tapping “<” button, you can go back Scale lists. This Tab provide Setting, In-App Purchase, Help and Other Apps. Change Middle C to C3 / C4. Change display for cell’s note to Note Name / Interval. You can limit showing Chords on main chords list. Preset has All Chords, Up to 4 notes Chords, Up to 5 notes Chords and User Preset. This option works on the first view on Chord Tab (if you don’t select Key or Rule) and Match View on Scale Tab. You can use more Chords & Scales. You can restore the purchased option in this app. ※ if you’ll show the display of the re-purchase, you’ll should be feel at ease, normally you’ll not purchase twice. Display simple help text. Text is scrollable. You can see the support page in Safari. You can send mails to the developer. If you have some ideas, some wishes or some question, please send mail. 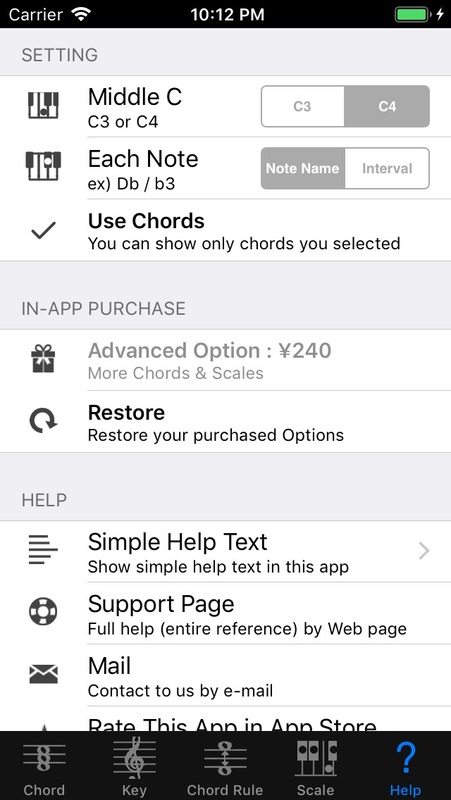 Open Chord NOTE’s page in App Store. You can rate this app and review one for people who download future. Version number of Chord NOTE in the right lower part. Open other apps in App Store. 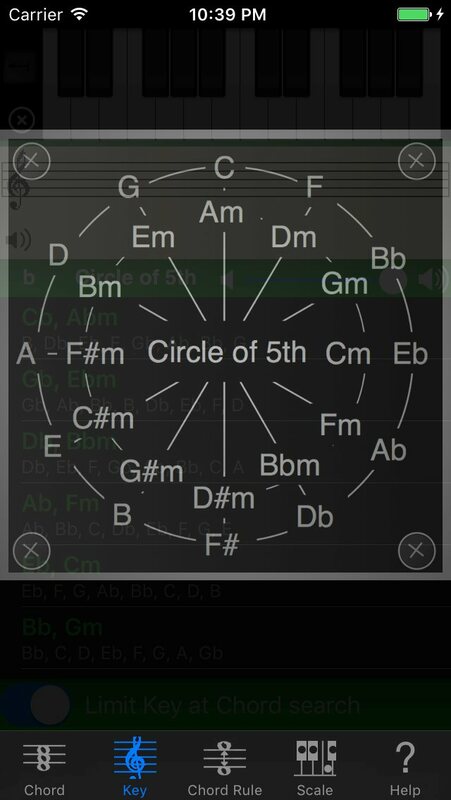 You can use Piano Kit and Guitar Kit as companion apps for Chord NOTE. Piano Kit and Guitar Kit can show all chords selected in Chord NOTE. You can temporarily store Chord Progression. This view allows you to operate very variously. You can add a chord by tapping “+” button in Chord Tab. 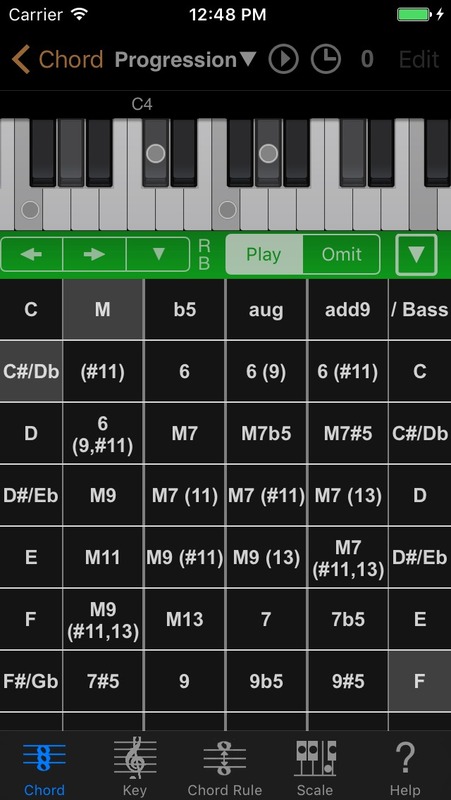 And if you tap “Chord Progression” button, you can move to this view. It would be useful to make rough sketch of the chord progression. You can export Chord Progression as SMF(Standard MIDI File) to Mail, Dropbox or others. And also you can import SMF you exported again. Chord Progression will be replaced with new one. And now you can export Chord NOTE’s progression native format. This allows you to import chord progression exactly in any situation. Practically you can save and open multiple songs in a very simple way. It is good idea, use “Export as Native Format” normally and use “Export as MIDI File” for importing by your DAW or other app. If you tap right top “Edit” button, enter in Edit mode. If you tap “< Chord” button on upper navigation bar, you can back to top page in Chord Tab. When you tap “Edit” button, you can delete each chord or move chord or modify various setting of chords. And please tap “Done” button for leaving Edit mode. You can listen sound by tapping each chord. When you tap the right “>” button, you can move to customize chord page. 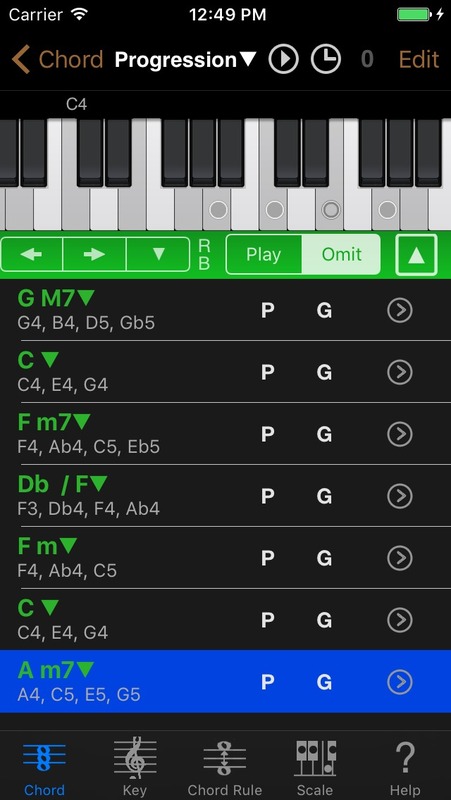 If you tap top “Progression▼“, Chord NOTE shows Title Menu. You can execute various command and change some settings. Top keyboard displays notes that make up selected chord. You can play Chord Progression by tapping top middle Play button. If you tap this again, you can stop. Top middle Clock button allows you to change tempo. And if you tap Export button in showing “Tempo Setting View”, you can export SMF. Chord NOTE has many operation methods of editing each chord. You can use Chord Picker for changing the selected chord to another chord directly. 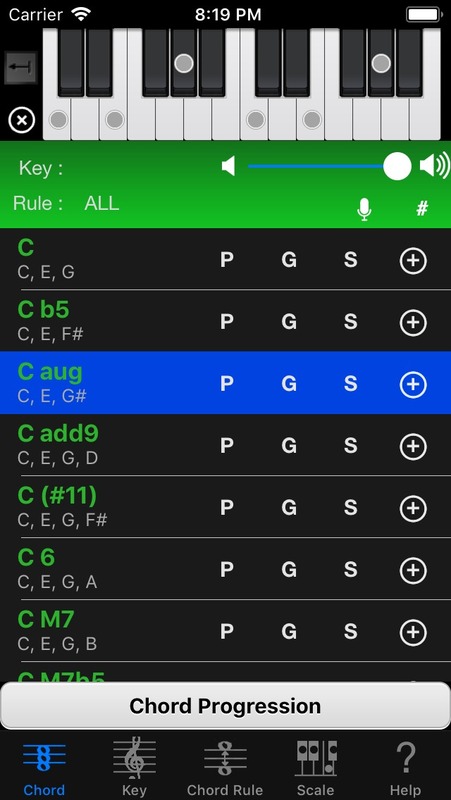 Please select any chord in chord list and tap upper right the arrow pointing upward. Chord Picker will slide up. You can replace the chord by selecting another chord in scrollable Chord Picker. And also you can change Bass note. You should tap upper right arrow button again to hide Chord Picker. Keyboard is now available horizontal scroll 4 octave keyboard. If it is not playing chord progression, it is possible to change note of selected chord by simply tapping the keyboard. And if you select “Omit” at “Play / Omit” button, you can omit (Temporal Mute) tapping note. Omitted note play no sound. Left and Right Arrow buttons allow you to move notes of selected chord. Method of movement is determined by the “Use As” of ▼ button. 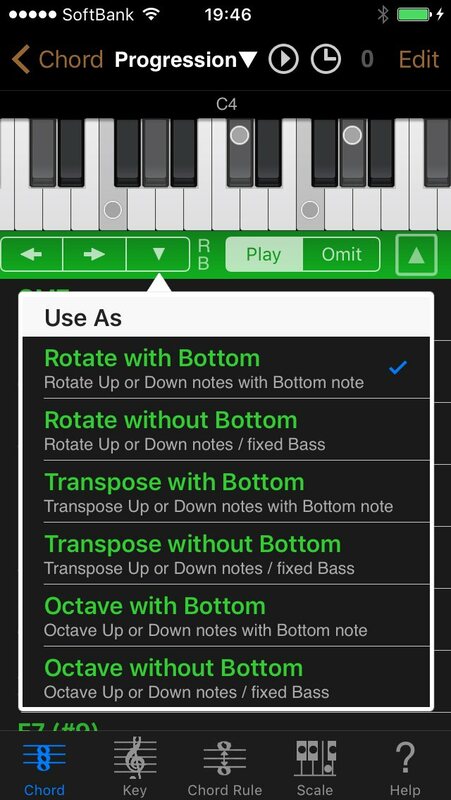 You can move up / down “Rotate”, “Transpose”, “Octave”. Rotate means Inversion in music theory. If you’d like to fix most bottom note as Bass, please select “without Bottom”. Otherwise, you’ll probably want to choose “with Bottom”. 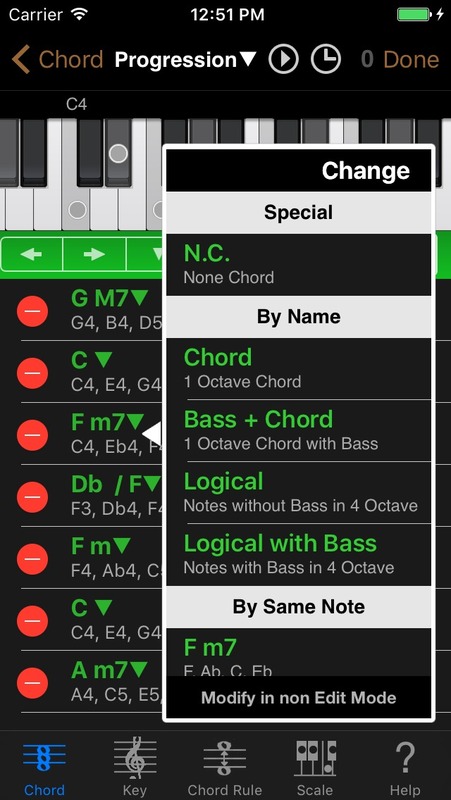 You can change Chord Name directly and set Chord’s notes to specific style. Like as previous Chord NOTE, it will show all notes in one octave. If chord has a special Bass also appears Bass under octave. Like as previous Chord NOTE, it will show all notes in one octave. Even if chord does not have a special Bass, also appears Bass under octave. It will display the first chord form to be made on the theory. Since they are going to pile up on more and more, for example, 9th is beyond the octave. It is displayed by the addition of Bass sound under the octave above Logical. This menu contains Guess Chord Name function. It will propose some chord names according to notes of the current chord. If you choose one, it is possible to change the chord name. Left side is used note names. Right side is unused note names. Normally chord that has less unused note names is better. If you select “with Bass”, you can choose /Bass. When you change chord name directly, you can set any words. However, it is good idea that you use Chord NOTE naming style. It’s very simple. 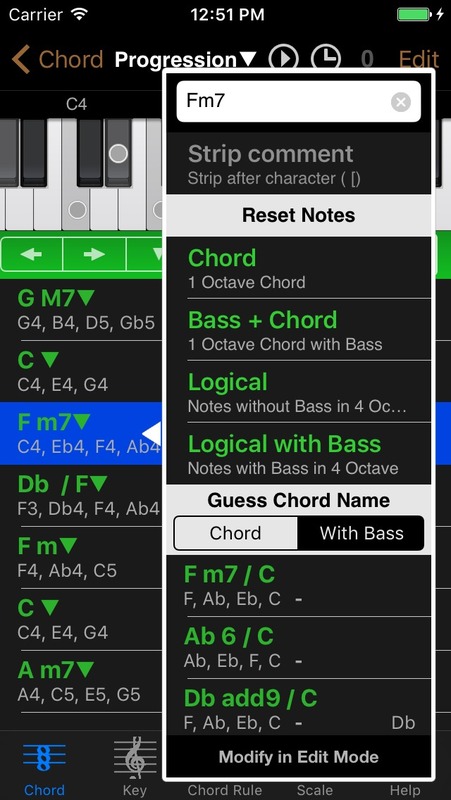 If you type this, Chord NOTE automatically recognize that Root is “G”, Chord Name is “m7”, Bass is “B”, Comment is “II”. And It is used this chord name recognition in Reset Notes and more. This naming is very easy. Write comment after ” [” ( Space + [ ). And other spaces are ignored. When you enter in Edit mode by tapping right top “Edit” button, you can edit in more detail. You can delete by tapping “ – ” button. And you can re-order chords by drag gesture. You can change Chord Form (N.C. / By Name / By Same Note / By Similar Note). And change display for right section to “None / Buttons / Beats” and change beat counts of playing. N.C. is None Chord. Chord NOTE play no sound. Similar Note shows similar chord forms (add 1 note, remove 1 note, move 1 note). You can try to hear chord sound by tapping the cell. Really you decide, please tap upper “Change” button. You’d like to cancel, please tap outside of this menu. Next figure is Beat Menu. To leave Edit mode, please tap top right “Done” button. When you tap top “Progression▼”, you can show Title Menu. When you paste a chord that you was cut or copied, you can add it to after selected chord. 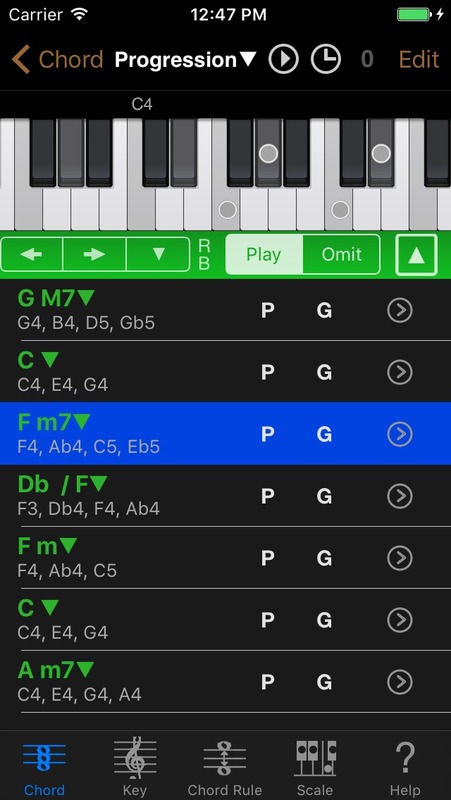 The chord of Chord Progression on Chord NOTE is compatible with the chord form of Sheet View on Piano Kit (another app). Export all chord progression & options. This file can be imported by Chord NOTE only. But you can import all exactly even in any situation. Please refer “Choose App” for Exporting and “Import SMF” for Importing. Search scale by chord name of selected chord. 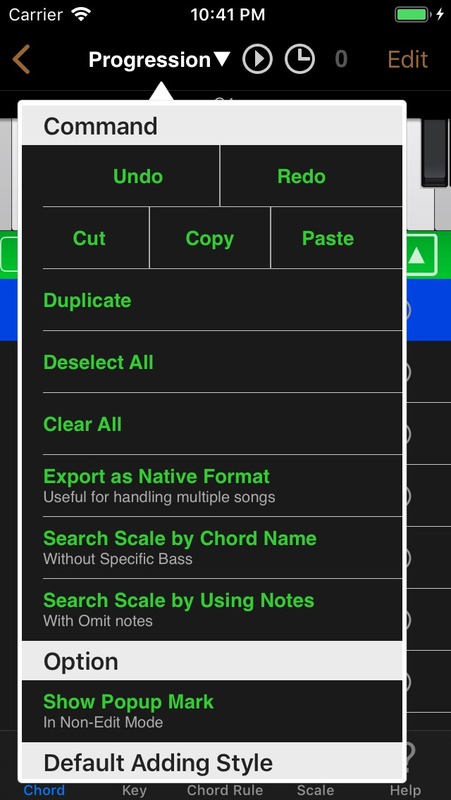 Search scale by using notes of selected chord. Show or Hide “▼” mark in non-Edit mode. You can change default style for adding chord to chord progression. You can show Tempo View by tapping Clock button. This view’s main feature is what you can set tempo for playing Chord Progression. You can change up to 99. If you press and hold ” – ” ” + “, can change continuously. Apart from the volume of the chord, you can set the volume of the click sound. Back to previous Chord Progression View. Revert Progression imported or changed SMF to Auto Saved Progression. 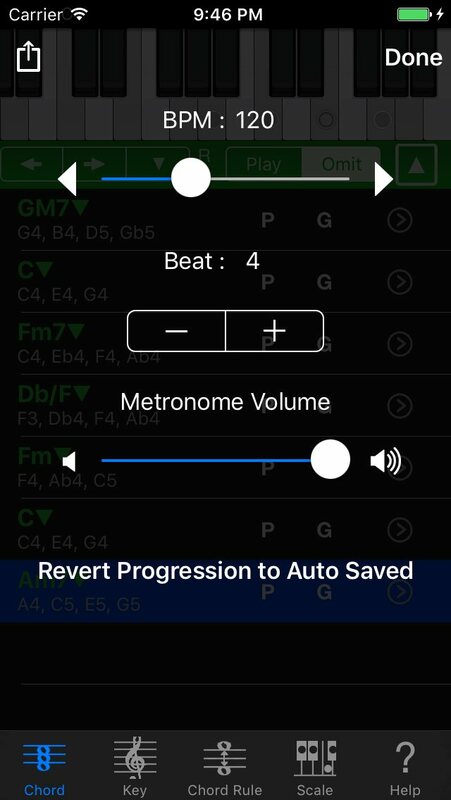 Chord NOTE save automatically Progression, when you leave this Chord Progression View. So you can revert to Auto Saved Chord Progression as long as you don’t move to other Tab or View. Make the setting to export Chord Progression to SMF (Standard MIDI File). Input MIDI File Name for exporting. Decide denominator for Time Signature. 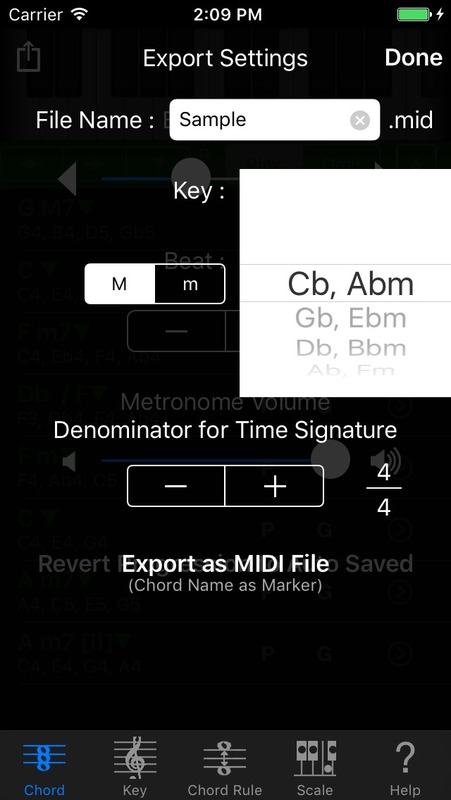 Numerator of Time Signature will be set by Beat in previous Tempo View automatically. Save these setting and just only back to Tempo View. Show “Choose App” dialog for really exporting as MIDI File. Chord Names will be exported as Marker. Export omit note as velocity 1 note. This view is displayed by tapping previous “Export as MIDI File” button. You can choose app for exporting SMF. For example, Dropbox does not appear in this list if you don’t install Dropbox.app. You can use MIDI file exported by Chord NOTE on your DAW (Mac/PC) as Chord Progression. Moreover, Chord Name will be exported as Marker. In addition, it is possible to import by Piano Kit or Guitar Kit. So you’ll be able to use the piano or guitar-specific chord forms. 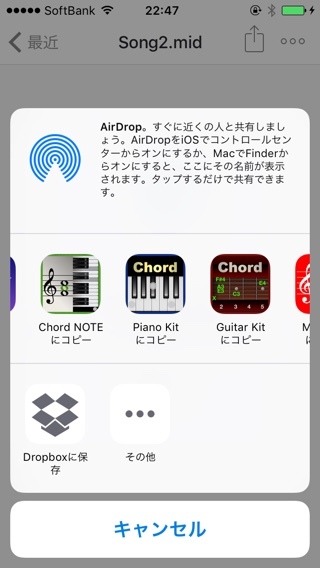 Apps are listed upper place, please select “Chord NOTE”. 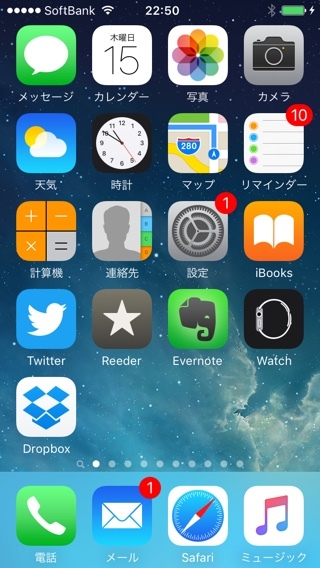 By the way, Mail.app show Chord NOTE in the upper column from the beginning. Of course, it is possible to import a previously exported SMF in Chord NOTE again, you can switch between multiple songs. You can edit each chord in Chord Progression. If you tap left chord name button on top navigation bar, you can back to previous page. Right wheel allows you to change Bass note. You can change chord directly by selecting in bottom chords list. Q. How many notes I should select in Key Tab and Chord Tab? A. Key Tab : You should select many notes in your melody, because you’d like to focus on one key. Chord Tab : You maybe select a little notes in your melody. Each people apply various chords for a melody, so we have many right answers. When you think about song’s deployment, you have rich potential for your song if you leave a lot of selectable chords. Q. Don’t change anything when I turn ON – Limit Key at Chord search – switch in Key Tab. A. Select one Key in above Key List. If you focus on chords, you decide ‘one key’ & turn ON this switch and you would like to select one Chord Rule. A. When Limit Key at Chord search is OFF at Key Tab, Chord Tab shows all Chords. 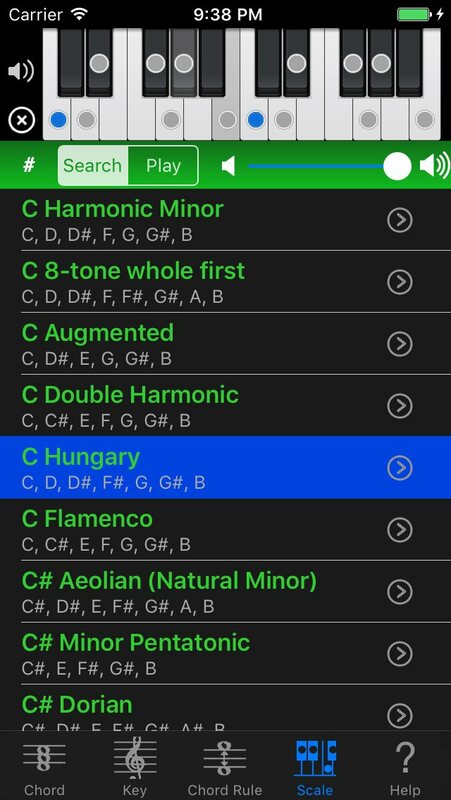 So if you select some notes at Chord Tab, you can become aware Chord Name what you play.